January 2012 – Share SharePoint Points ! A new feature in SP 2010 is metadata navigation and filtering which allows users to filter the list or library content by using the metadata. A list owner can use this feature to promote fields on the list as key navigational fields, and users viewing those lists see a filtering user interface (UI) that enables them to filter the current list view to show items with the desired values in those fields. Metadata Navigation and Filtering works with list-level indices to support a seamless browsing experience—even in very large lists that contain tens of millions of items. This feature promotes the use of metadata and tagging by ensuring that, when items are well-tagged across multiple fields, they are inherently more discoverable than list view items that are not tagged. A best article on how to configure this by UI is posted at the Microsoft site here. But being a developer our concern is how difficult this configuration if we want to do it in a feature. Well, answer is its quite easy. Below is the code which allows you to configure the metadata navigation and filtering. 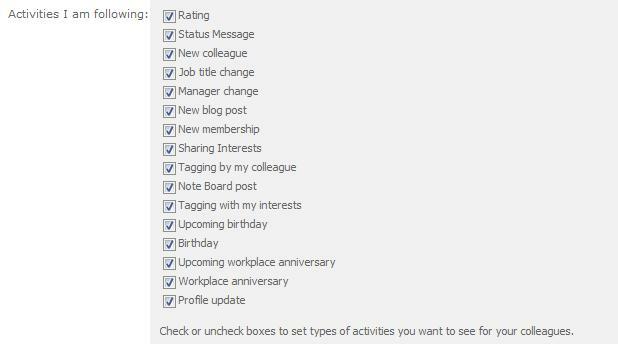 SharePoint provide a excellent feature under my site which display the recent activities of the user performed recently using Recent Activities web part and for colleagues activities it provides My newsfeed web part. These web parts will show only those activities which users was configured under “Edit My Profile” page. Following is the screen shot of the Out of box activities feeds. In order to create the custom activity feed, There are a sample console application provided by the microsoft SDK SharePoint Server 2010: Activity Feeds Console Application just to register the custom activity feed on the server. Now if you successfully created the activity feed then next step is to create the activity events. Here I am demonstrating the example of the add document event capture and then register it to my custom activity feed. For this, I need to create a List item event receiver. I will capture the ItemAdding event of the document list and then create a event for the uploaded document. There are few more methods which are used to grant the permissions to the user so that they can create the event without any issue. But we must have to revoke that access for other unauthenticated changes. SharePoint 2010 has built-in support for Silverlight Web Parts, making it easy to get Silverlight applications up and running. But in real scenarios sometime requirement needs more customization then its hard to integrate the requirement with out of box WebPart. In this article I will explain how a SilverLight application can be integrated to the sharepoint webpart. Analog clock should be displayed to the home page of the site which can be personalized and customizable for the normal user. User can add as many as world clocks as he/she want and set the timezone and able to do basic configuration. following are the key points of the requirnments. Can add multiple clocks to the WebPart. After goggling few I found Bamboo webpart which is pretty fine for me and fits my requirements but unfortunately got some error on test server related to safe control which is beyond my approach to fix. Finally I found a open source WebPart on codeplex which perfectly suits my requirement except adding multiple clocks. Then i have downloaded the code and did some of customization with the share point project as well as silver light project. "<img src='http://go.microsoft.com/fwlink/?LinkId=161376' alt='Get Microsoft Silverlight' style='border-style: none' /></a></object>"
With some modifications in the silverlight like height and width adjustments. This code will provide functionality to add more clocks to the webpart. Site Map is a very important feature for the users to have a high level view of all sites and even for cross site navigation. I have implement recently a very basic Site map webpart which iterate through all the site collections with in a web application and display them as a tree view like structure. Using the above code simply we can iterate through all the site collections and then sub sites of each site. Sometimes the out of box navigation does not provides us the type of navigation wants on the whole application. To make such custom navigation which is consistent throughout many site collection it is batter to create a custom user control and simply register it in to the master page. Applying the same master page on every site collection will do the job. 1) Right click on the project and the click on Add New Item. 2)Then add a User Control. Name it as per the convention. also add below line at the required placeholder. Custom home page is quite common requirement for any development project. This post helps you if you need to add out of box web part to page. This post contains good details how to deploy custom page. AllUserWebPart tag can be used in onet.xml under “File” tag. If we are adding the custom page using the feature then also the same way we can define this tag value to the File tag. According to the client’s requirement, every site must be set as a custom home page other then “Pages/Default.aspx”. I have added a site definition using CKSDev tool and add this page using Onet.xml. This code will also work for any site template. Sometimes client asked to add list view web part on the home page of the site. Its easy to add this view just by user interface with some little configuration changes. But using the feature you must know the trick to get the summary view of the calender list. Use following code just create a summary view of the list. ViewGuid = calendarlist.Views[string.Empty].ID.ToString("B").ToUpper()// Use //String.Empty if you are using SP 2007. Hope the above information will be helpfull to make some little modifications in the summary view using the c#. Using the above convention you can avoid most of the unexpected errors related to content query webpart.